This simple cabbage salad recipe is one of our favorites. It's super quick to throw together and the end product is a crispy, crunchy bowl of salad that will tease your taste buds to no end. Keep it traditional by using Asian style veggies such as snow peas, carrots, water chestnuts and onions or throw in all your favorite vegetables for a healthy, flavor filled meal that works perfect as a main dish or a savory side dish. Top your salad with an Asian inspired homemade dressing and serve! Whether you pair it with your favorite veggie burger recipe, hot whole wheat rolls or a batch of delicious homemade soup this salad will steal the show every single time. Enjoy! And be sure to let us know what you think. 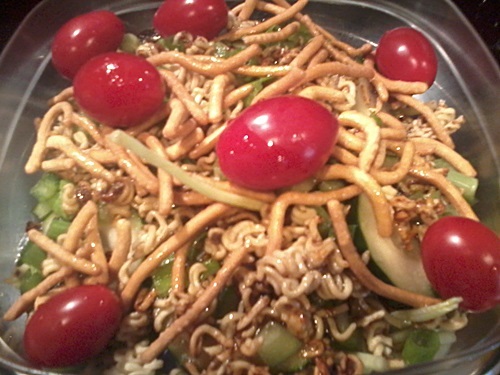 In a skillet, toast the crushed ramen noodles and nuts in oil until they are golden brown. Chop your green bell peppers, red bell peppers and green onions. Slice your cucumbers and your tomatoes and add them to the coleslaw mix. Toss to blend. Add the toasted ramen noodles and nuts. Whisk together 1/4c honey, 3 tbsp rice wine vinegar, 1 tbsp soy sauce and 2 tbsp sesame oil until well combined. Pour the dressing over your finished salad and toss to coat. Serve immediately. Seed the cucumbers before chopping to keep them crisp. The seeds and pulp tend to soften the vegetables in the salad and take away some of that great crunchy texture. Shredded carrots taste wonderful in this recipe. Buy a bag of matchstick carrots and add them to the mix. They've got a natural, slightly sweet taste to them so keep that in mind when adding your dressing. A little bit of the dressing goes a long way, so be careful not to add too much. Use just enough to coat the salad or, better yet... add the dressing as you serve the salad. This will help keep the salad crunchy and everyone can use as much or as little as they like! In a medium saucepan, combine all dressing ingredients. Cook on medium low for 5-10 minutes, until the sugar is dissolved. Allow a few minutes to cool (so your veggies will stay crisp), pour over your cabbage salad and toss to coat.